William Thomson was born June 26, 1824, in Belfast, Ireland. The family included seven children. His mother died in 1830, when he was six, and his father, James Thomson, then raised him alone. The senior Thomson wrote textbooks and taught mathematics. In 1832, the family moved to Glasgow when his father was named chair of the mathematics department at the University of Glasgow. William began his studies at the University of Glasgow. The school system allowed promising students to enrol at the University to prepare for the entrance examinations. The senior Thomson was a strict disciplinarian and schooled his children in the latest mathematical theories. William had a gift for mathematics and quickly excelled. His other coursework included astronomy, chemistry, and natural philosophy (physics). His published his first two papers when he was 16 and 17. In 1841, William was accepted at Cambridge. He was interested in athletics and competed in sculls. He graduated in 1845 at age 21 and moved to Paris to do research and gain practical experience working for Henri-Victor Regnault, a physicist and chemist. 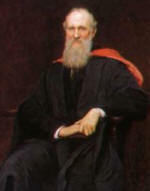 The following year, the chair of natural philosophy (physics) at the University of Glasgow was available, and the senior Thomson successfully campaigned for his son to be named to the position. William accepted and remained chairman for the next 53 years. William was a successful teacher and administrator. He required that students complete laboratory work as part of their program, and he recognized outstanding students with prizes and awards. In 1851, he was accepted to the Royal Society of London. From 1857 to 1858 and from 1865 to 1866, Thomson oversaw the construction of the telegraph cable between Ireland and Newfoundland. He served both on the board of directors and as a scientific advisor. He designed and built a mirror galvanometer which made communication more efficient. His wealth was secure from that point on. He enjoyed royalty income from his patents and healthy consulting fees from the engineering firms he started. Thomson bought an estate and a 126-ton yacht. His interests turned to things of the sea. He invented a marine compass, an instrument for measuring tides, and sounding equipment, and then started a commercial enterprise to manufacture these inventions. Thomson's greatest contribution to the advancement of science may have been his penchant for and brilliance in seeing how theories from various branches of science fit together to create a more complete explanation of phenomenon. His work aided the understanding and advancement of modern physics. Not all of Thomson's ideas proved true. He calculated the age of the earth and the sun, incorrectly. He was sure that anything heavier than air couldn't fly. He declared in 1900 that there was nothing more in physics to be learned. He was knighted by Queen Victoria in 1866 and named to the peerage in 1892 as Baron Kelvin of Largs, a name he chose himself. Lord Kelvin died December 17, 1907 at his home, Netherhall, near Largs, Scotland, and is buried at Westminster Abbey in London, next to the tomb of Sir Isaac Newton. Awards and Honours: Member, Royal Society of London, 1851 Royal Medal, 1856 Copley Medal, 1883 President, Royal Society, 1890-1895 Member, Royal Society of Edinburgh President, Royal Society of Edinburgh, 1873-1878; 1886-1890; 1895-1907 President, British Association for the Advancement of Science, 1871 numerous honorary degrees.